Manila, Philippines - The Departmenyt of Energy (DoE) on Thursday responds to the statement of MERALCO for it's assumption that Luzon will experience power shortage due to the lack of new power plants coming in. DOE says that in the 2012 Power Development Plan (PDP), peak demand in Luzon grid is expected to increase at an annual average rate of 4.13 percent from 7,969 MW in 2012 to 16,477 MW in 2030. Based on this, correspondingly, the grid will require an additional 500 MW by 2016 and 8,100 MW by 2030. 20 MW Maibarara Geothermal – It will be commissioned by July 2013 and commercial operation is 4th Qtr. 2013, which is ahead of its original schedule. In addition to new power plants, there are also uprating/rehabilitation of power plants that will add capacity to the grid, these are: 130 MW additional capacity from Bacman Geothermal and 5 MW per year (starting 2012 -2015) from Binga hydro uprating, DoE added. PRC and Board of Nursing (BoN) on Wednesday announces nurse board exam NLE for December 2012 results finally out online on the commission's official website. PRC said that out of 49,066 , there were 16,908 successfully passed the nursing board exam. Saint Paul University of Tuguegarao was named top performing school rank 1 for having 99.28% passing rate or 137 out of 138 examinees passed the board. A graduate of Colegio de Sta. Lourdes of Leyte Foundation, Inc, Glicyl Arante Alvero is December 2012 NLE Top 1 for garnering 85.80% average grade. Nurse Licensure Examination was given by the Board of Nursing in the cities of Manila, Baguio, Cagayan de Oro, Cebu, Dagupan, Davao, Iloilo, Laoag, Legazpi, Lucena, Nueva Ecija, Pagadian, Pampanga, Tacloban, Tuguegarao and Zamboanga last December 16-17, 2012. Registration for new nurses shall require the following: duly accomplished Oath Form or Panunumpa ng Propesyonal, current Community Tax Certificate (cedula), 2 pieces passport size picture (colored with white background and complete name tag), 1 piece 1” x 1” picture (colored with white background and complete name tag), 2 sets of metered documentary stamps and 1 short brown envelope with name and profession and to pay the Initial Registration Fee of P600 and Annual Registration Fee of P450 for 2013-2016. Korean leading mobile phone manufacturer, Samsung on Tuesday launches budget smartphone armed with LTE capability powered by Android Jelly bean. Express is available in the US since November 2012 and now ready to conquer other countries including the Philippines mobile market this 2013. 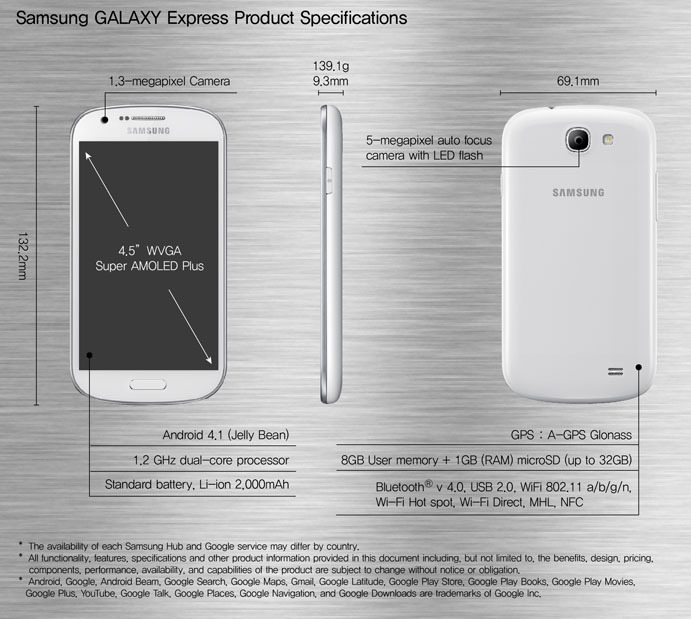 Samsung said that 'Galaxy Express' device is called ' a value-driven 4G LTE smartphone, designed for the young social explorer'. It is priced 99 dollars in the US but did not disclosed information on the release date and prices for worldwide release. Samsung GALAXY Express, a feature-rich multimedia powerhouse that makes 4G LTE’s dazzlingly fast network accessible to everyone. The GALAXY Express offers great performance, connectivity, easy usability and a superior battery to enhance life’s everyday pleasures. The phone is expected to run on 800,900, 1800, 2600 LTE bands and 850,900 and 2100 HSPA+ bands. 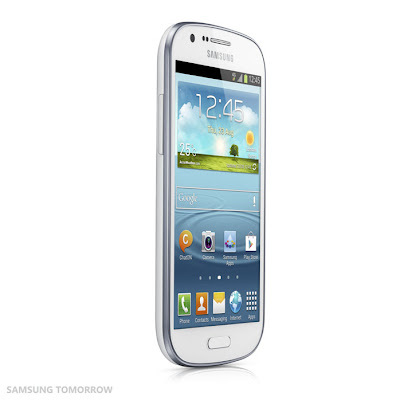 It has 1.2 GHz dual-core processor and having 4.5” WVGA Super AMOLED Plus display. It's camera is 5-megapixel auto-focus and having LED flash and sub-camera of 1.3 megapixels. Sharing has never been easier with Samsung’s unique sharing capabilities on the GALAXY Express. AllShare Play enables a device-to-device remote sharing to freely share and play content across Samsung Smart TV and Smart mobile devices, ensuring you’re always linked and connected through a single account anytime, anywhere. Moreover, with S Beam, you can easily touch and transfer your favorite movie or the latest songs just by touching another device, to enjoy real-time sharing of the moments that count in such a short time. Mobile High Definition Link (MHL) is a simple mirroring interface that lets you link your smartphone directly to any HD display for convenient and comfortable viewing. Near Field Communication (NFC) allows auto-transfer of text or data wirelessly to other NFC enables devices, facilitating instant wireless sharing and viewing. 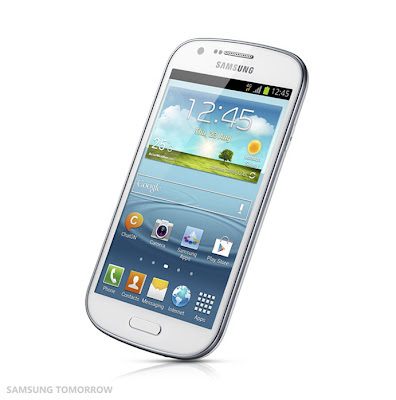 The announcement of Samsung is expected since it's rival Apple releases update on iOS version the same day . 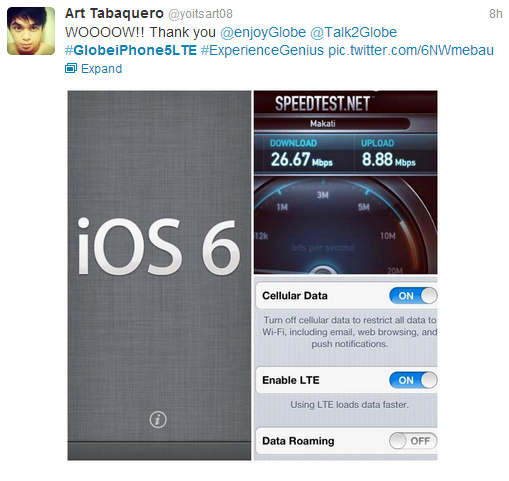 iOS version 6.1 of Apple adds LTE capability on iPhone 5 for 36 carriers worldwide including two carriers from the Philippines- Smart and Globe. According to research firm, Strategy and Analytics, the global LTE smartphone shipments are expected to triple this year, allowing the technology to take off on a grander scale and driving down device prices. "LTE smartphone shipments will grow from 90.9 million units in 2012 to 275 million in 2013. ", the research company said. June 23, Update: According to the price comparison website PricePanda, Samsung Galaxy Express I8730 LTE is now available for online purchase and priced at PHP 13,790 (Unlocked, 8GB, White). TheSummitExpress will update this page for additional information on Samsung Galaxy Express price, availability and carrier (Smart or Globe or both?) in the Philippines. The long wait is over as Apple today releases iOS version 6.1 update that enables LTE capability of their latest gadget offering, the iPhone 5. After the official announcement, telco wars between Smart and Globe heats-up anew on Twitter with both telco on trending list - #SMARTiPhone5LTE and #GlobeiPhone5LTE. iPhone 5 users are extremely excited to update their OS to try the latest evolution. 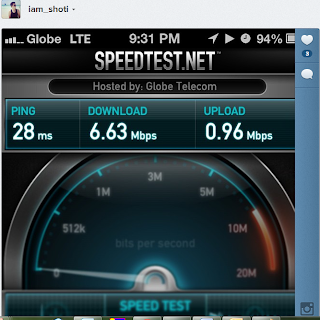 TheSummitExpress posts here the speedtest results for Smart vs. Globe LTE. 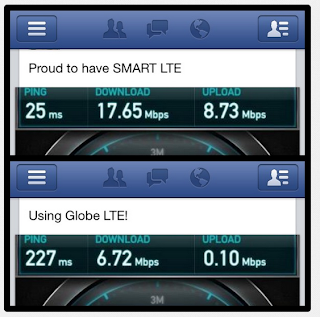 Today seems to be another milestone for LTE in the country after the successful commercial launch last August 2012. Social buzz of Smart LTE prevails over Globe on the whole day trends and reactions of netizens. It is attributed to the wider coverage and commercial availability of Smart LTE across Metro Manila and selected areas nationwide. On the press statement of the wirelesss leader, it says that around 300 enodeBs are now active and more than 770 establishments in the 10 cities already subscribed to Smart LTE. 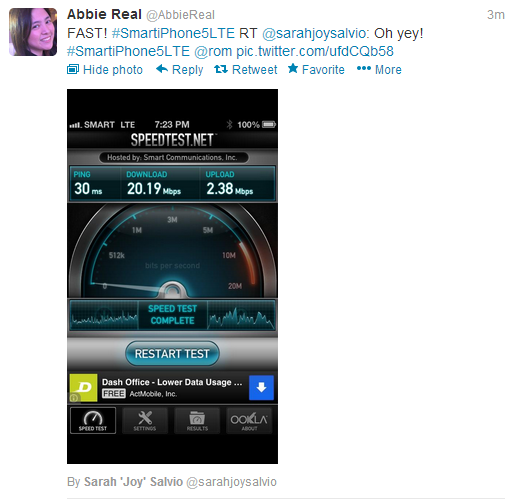 Globe LTE on the other hand is concentrated in Makati City only. 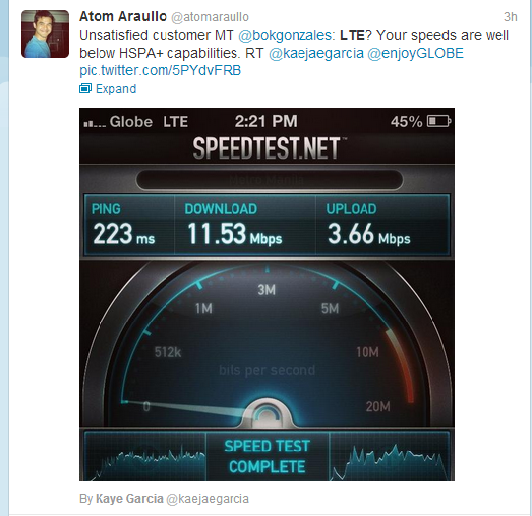 As of January 2013, Globe said that LTE coverage expands at select areas of Manila, Pasig City, Quezon City, Taguig City, Muntinlupa, Mandaluyong, Cebu City, and Boracay. The company did not disclosed exact counts of the total on-aired enodeBs. 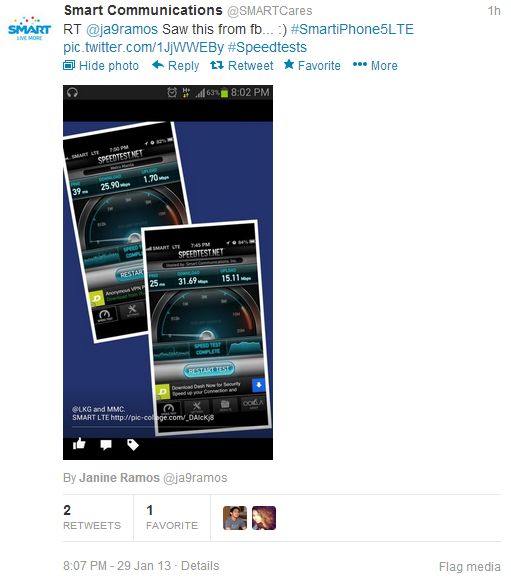 iPhone 5 users of Smart scores big as observed on some reactions of netizens on Twitter. As a bonus and enticement to loyal subs, Smart gives free LTE service on postpaid data users until April 30, 2013 without separate data package. 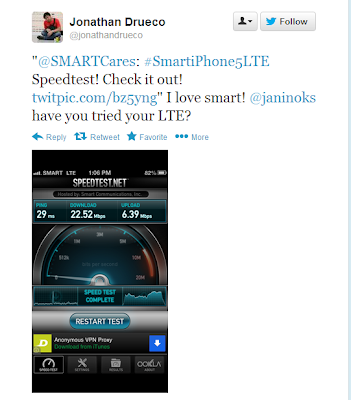 To get LTE on iOS 6.1 update, you need a new nano sim if on Globe. No need for new sim for Smart users. Which telco do you think delivers the promise of LTE speed in the country? Tell us what you've got on your speedtest. 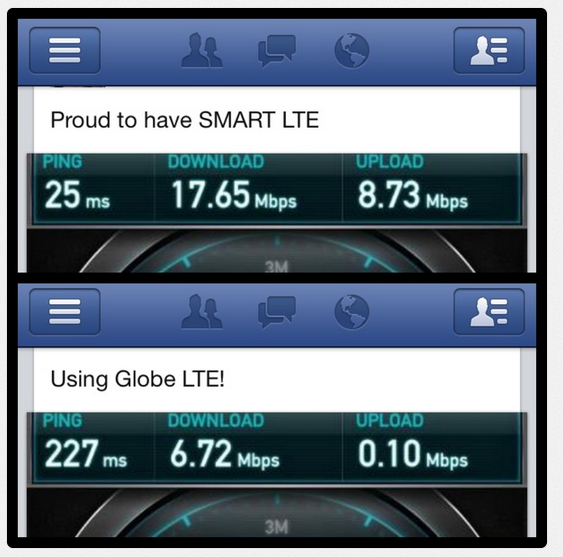 We're going to update this post for more details on LTE speeds and roll-out in Metro Manila. 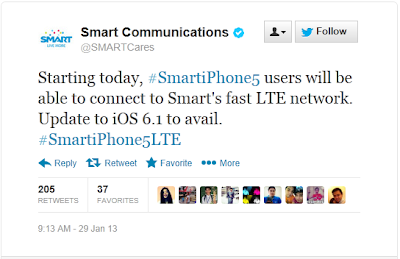 With the long-awaited release of Apple iOS 6.1, iPhone 5 users can now enjoy the Philippines’ most extensive Long Term Evolution (LTE) service from the wireless leader, Smart Communications, Inc. (Smart). It is expected that after the first half of the year, data surge on Smart LTE network will prevail. Smart iPhone 5 users on iPhone Plans 999 and 2499 and Unlidata Plans 1500, 2000, and 3000 can automatically use Smart LTE for free until April 30, 2013. “Subscribers of Smart iPhone 5 postpaid plans with unlimited data can now get download speeds that are up to 20 times faster than the usual 3G connection on their mobile device,” said Smart Executive Vice President and Wireless Consumer Division Head Emmanuel C. Lorenzana. “You can enjoy this superior broadband service in a growing number of LTE zones in Metro Manila and in key cities in different parts of the country,” Lorenzana added. 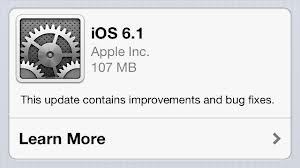 To download iOS 6.1 over-the-air, go to the iPhone’s Settings menu and click on General > Software Update. Hit “Download and Install” and follow the on-screen instructions. Alternatively, iOS 6.1 may be applied via iTunes by connecting the iPhone 5 to a Mac or a PC. Regarded by telcos and tech pundits worldwide as the fastest fourth generation (4G) wireless connection, LTE is ideal for downloading movies in minutes, lag-free gaming, ultra-fast surfing, buffer-free video streaming, and mission-critical Internet use because of its low latency and fast download speeds. 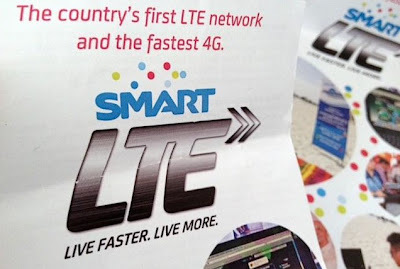 Launched in August 2012, Smart LTE is the Philippines’ first commercially-available LTE service and is currently available in more than 770 establishments across 10 cities in Metro Manila, and in select areas in Boracay, Cebu, and Davao. Smart LTE is backed by the country’s only 100% modernized and super-charged mobile network which boasts of more than 54,000kms of fiber optic cabling. Unlike traditional copper wiring and microwave radios which transmit data through electric and radio signals, fiber optic cables use pulses of light beamed through thin wires of glass. This ‘optical’ technology allows for efficient, high speed transmission of data from Smart’s core network to thousands of base stations nationwide, providing for unparalleled speed and stability. “Together with our parent company PLDT, Smart has more than four times the number of fiber optic cables than the competition,” said Lorenzana. “More fiber means Smart subscribers enjoy faster and more reliable call, text, and data services—an experience which simply cannot be matched on any other service provider,” Lorenzana added. CUPERTINO, California-based giant , Apple today announces updated iOS to version 6.1, adding LTE capabilities to 36 additional iPhone carriers and 23 additional iPad carriers around the world. Listed on the supported LTE networks in the Philippines are Smart and Globe on 2100, 1800 and 850MHz bands with model A1429. 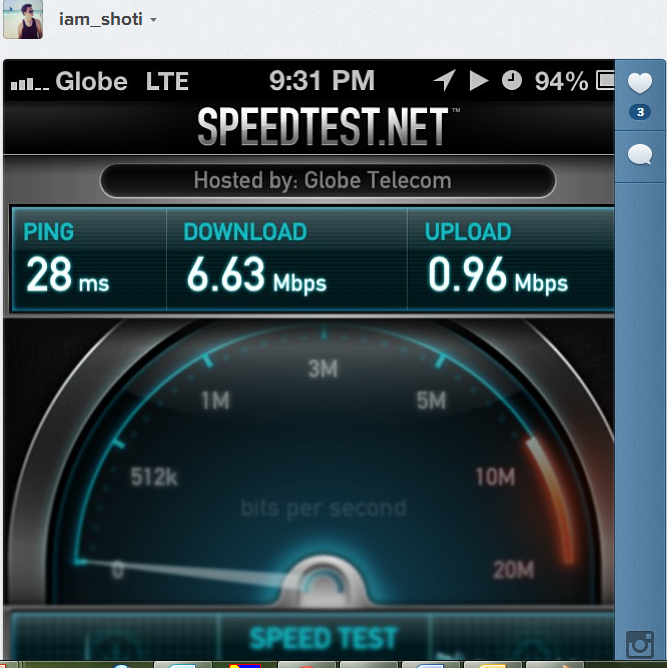 More iPhone 5, iPad mini and iPad with Retina display users can experience now ultrafast wireless performance to browse, download and stream content at blazing fast speeds. To date, iOS users have uploaded over nine billion photos to Photo Stream, sent over 450 billion iMessages and received over four trillion notifications. iOS 6 features include Siri, which supports more languages, easy access to sports scores, restaurant recommendations and movie listings; Maps with Apple-designed cartography, turn-by-turn navigation and Flyover view; Facebook integration for Contacts and Calendar, with the ability to post directly from Notification Center, Siri and Facebook-enabled apps; Shared Photo Streams via iCloud®; and Passbook®, the simplest way to get all your passes in one place. Additional updates in iOS 6.1 include the ability to use Siri to purchase movie tickets in the US through Fandango, and iTunes Match℠ subscribers can download individual songs to their iOS devices from iCloud. The revolutionary App Store offers more than 800,000 apps to iPhone, iPad and iPod touch® users, with more than 300,000 native iPad apps. App Store customers have downloaded over 40 billion apps, and Apple has paid over seven billion dollars to its incredible developer community. Customers can choose from apps in 23 categories, including newspapers and magazines offered in Newsstand, games, business, news, sports, health & fitness and travel. LTE is available on iPhone 5, iPad mini and fourth generation iPad Wi-Fi + Cellular models through select carriers. Network speeds are dependent on carrier networks, check with your carrier for details.Information about LTE carriers can be found at www.apple.com/iphone/LTE and www.apple.com/ipad/LTE. After several months of waiting, UST Entrance Test Results (USTET) for AY 2013-2014 is finally out today, January 28, 2013. UST Office of admissions announces that results are now available online. Results page is now ready for thousands of visitors this day. 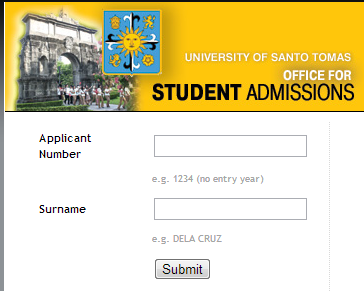 Result is accessible online by logging-in to the UST portal with your Applicant Number and Surname. Check here for your test results. On January 25, the premier Catholic University said that results are posted at the Alumni Walkway inside the university. Announcement that results will be available on January 28, 2013 was released early on the first month of the year. This is a good advantage for the takers as they knew already when will be the exam date of judgement. For the concerns and requirements after passing USTET, check out this post for more details. Congrats to all passers of the recent USTET! Good luck on your studies in the no. 1 Catholic University in the Philippines. Share now and express your thoughts here or in social media. CUPERTINO, California—Apple announces financial results for its 13-week fiscal 2013 first quarter ended December 29, 2012. The Company posted record quarterly revenue of $54.5 billion and record quarterly net profit of $13.1 billion, or $13.81 per diluted share. These results compare to revenue of $46.3 billion and net profit of $13.1 billion, or $13.87 per diluted share, in the 14-week year-ago quarter. Gross margin was 38.6 percent compared to 44.7 percent in the year-ago quarter. International sales accounted for 61 percent of the quarter’s revenue. The Professional Regulation Commission (PRC) announces on Wednesday full results of January 2013 Marine Deck Officer Board Exams. List of passers, top 10, performance of schools and top performing schools are available on this page. 23 out of 47 (48.94%) passed the Master Mariner Licensure Examination, 156 out of 409 (38.14%) passed the Chief Mate Licensure Examination and 687 out of 1,247 (55.09%) passed the Officer-In-Charge of a Navigational Watch Licensure Examination given by the Board for Marine Deck Officers in Manila and Iloilo this January 2013. PRC said that a total of 40 examinees are exempted from taking the practical examinations as they opted to submit a Certificate of Training and Certificate of Assessment in the Ship Simulator and Bridge Teamwork (SSBT). 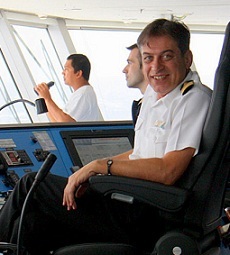 The members of the Board for Marine Deck Officers are Capt. Jaime D. Aquino, Chairman; Capt. Ireneo U. Delos Santos, Capt. Romeo C. Abuyuan and Capt. Marsolito A. Cruz, Members. Registration for the issuance of Certificate of Registration and Professional Identification Cards will start on January 28, 2013 but not later than February 15, 2013. The date and venue for the oathtaking ceremony of the new successful examinees in the said examination WILL BE ANNOUNCED LATER. PRC reminded that the deadline for submission of Certificates of Ship Simulator and Bridge Teamwork with Practical Assessment will be on February 12, 2013. 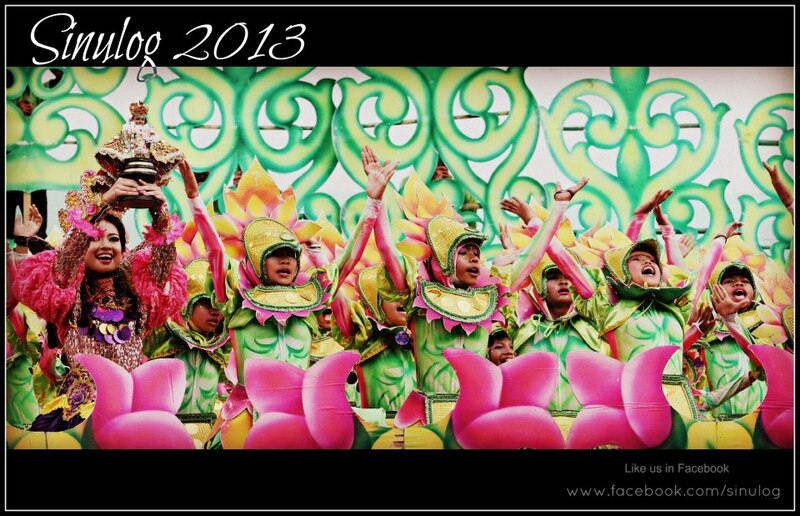 Major highlight of Cebu Sinulog Festival 2013 is the Grand Parade that took place Sunday, January 20, 2013 with an estimated crowd of 1.4 million flocks to Queen City of the South major roads to honor feast of Sr. Santo Niño. 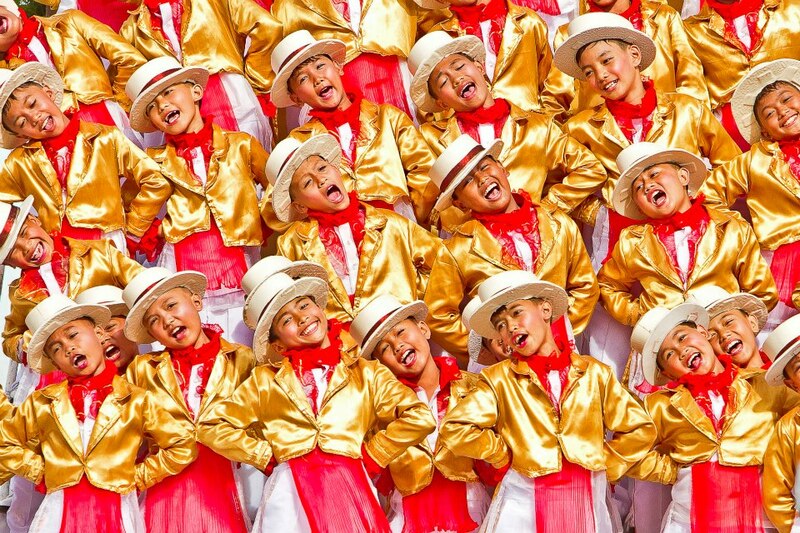 A total of 142 contingents consisting of 40 dance groups, 46 floats, 28 puppeteers and 28 'higantes' participates in the grand parade. The Festival started with a pontifical mass held at the Basilica del Santo Niño celebrated by Cebu Archbishop Jose Palma. In his homily, Palma highlights: "If we want to journey in faith, Sto. Nino sets an example of obedience. With freedom comes responsibility." Colorful and creative floats and mascots also took part in the parade. 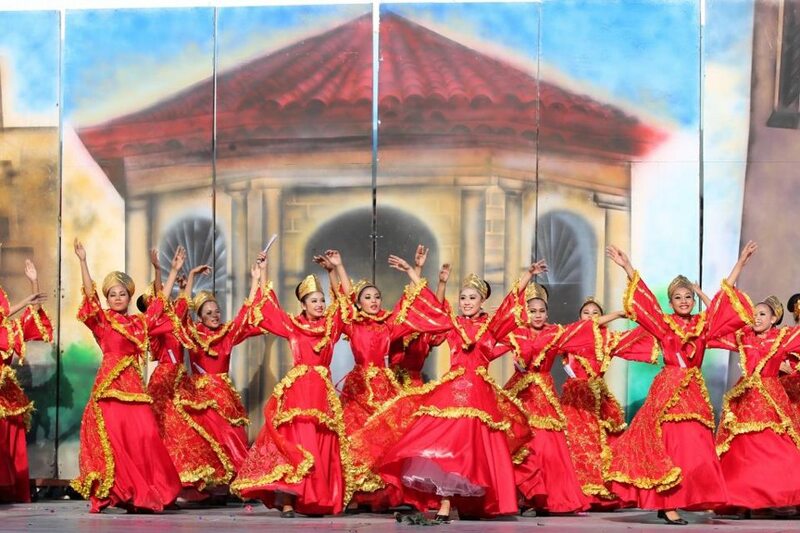 Artists from ABS-CBN, GMA Network, and ABC5 also graced the grandest festival of Cebu. National Police Commission (NAPOLCOM) exam results that cover Philippine National Police (PNP) entrance and promotional examinations conducted last October 14, 2012 is officially released on February 6, 2013 with list of passers and top 20 announced by the commission. A total of 32, 530 examinees took exams at different testing centers nationwide: Makati City, San Fernando City, Tuguegarao City, San Fernando, Pampanga, Calamba City, Palawan, Legazpi City, Iloilo, Cebu, Tacloban, Pagadian, CDO, Davao, Koronadal, Baguio, Butuan and Cotabato City. The 3-hour exam conducted consists of 200 multiple choice items that covers General Information, verbal, quantitative and logical reasoning. Aside from online availability of results, NAPOLCOM will also notify nationwide results via post at the commission's central office located at 371 Senator Gil J. Puyat Avenue, Makati City. Regional list will be posted in each ot the NAPOLCOM Regional offices also. Report of Rating (RR) will be mailed to the examinee's mailing address. Verification may be made with the Examination Division, Personnel and Administrative Service (PAS), NAPOLCOM Central Office. An examinee who passed the test but did not receive his/her RR may request for issuance of a certification from the same office, upon payment of One Hundred Fifty Pesos P150.00. For requests sent through postal mail, payment shall be in money order form payable to the National Police Commission, # 371 Senator Gil J. Puyat Avenue, Makati City 1200. 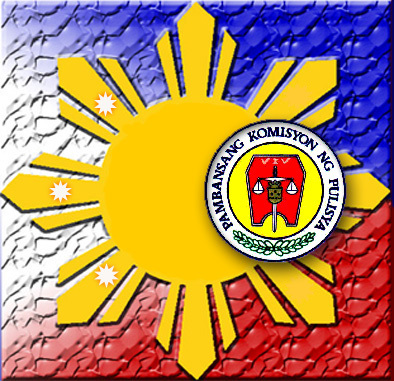 The NAPOLCOM is the agency of the Philippine government that administers and controls the Philippine National Police (PNP). 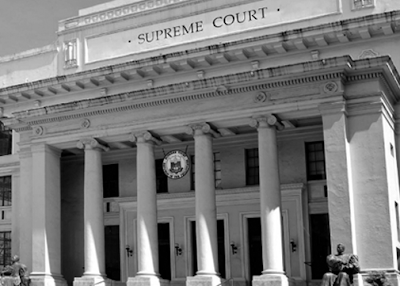 Under RA 8551 otherwise known as the "PNP Reform and Reorganization Act of 1998", the Commission regained the powers to investigate police anomalies and irregularities and to administer police entrance examination". The PNP ENTRANCE EXAMINATION is open to all Filipino citizens who possess the age, height and educational requirements as provided in the PNP Examination announcement and for Police Officers I (PO1) whose appointments are temporary for lack of appropriate eligibility. Those who pass the examination are conferred by the National Police Commission (NAPOLCOM). The PNP Entrance eligibility which is appropriate for appointment to the rank of PO1, as prescribed under Sec. 30 of Republic Act No. 6975, as amended by Republic Act No. 8551. During the conduct of exam last October, PIA and NAPOLCOM reported two cases of cheating in Pampanga and Nueva Ecija. Two personnel of PNP Pantabangan Police Station in Nueva Ecija were caught exchanging answer sheets while taking the Police Officer Examination. Ten police personnel and one civilian examinee were likewise caught in possession of cellphones while still inside the Pampanga Test Center premises, which is a clear violation of the policy of the Napolcom that no cellphones are allowed inside the examination center. NAPOLCOM Vice-Chairman and Executive Officer Eduardo U. Escueta said that for April 2012, 50.49% passing rate in the Superintendent exam is the highest passing percentage in the last 10 years. If you find this informative, we recommend to ShareThis on social media via Facebook, Twitter and Google Plus. Bookmark this page for easy access of exam results announcement. Don't forget to Like Us on Facebook and Follow Us on Twitter for real time updates. Department of Education (DepEd) releases statement for the upcoming 2012-2013 National Achievement Test (NAT) that is scheduled to administer on March 2013 for a selected levels of elementary and high school students in public and private schools nationwide. The conduct of examination for 4th year students of public and private schools is set on March 6, 2013, for Grade 3 pupils of public and Madrasah schools, the date of exam is March 12. And on March 13, it is the turn of Grade IV pupils of public and private schools to take the NAT. Education secretary Armin A. Luistro headed the announcement last week. NAT is administered annually by DepEd to gauge the academic performance in key subjects of elementary and secondary students in both public and private schools. Luistro said that only the listed public and private schools are allowed to participate in the upcoming test. Certificate of rating (COR) per subject will be released for Grade IV examinees. This will reflect the readiness for secondary education, Luistro said on news briefing. The NAT used to be called the National Elementary Achievement Test (NEAT) for the grade school level and the National Secondary Achievement Test (NSAT) for the high school level. Both were successors of the National College Entrance Examination (NCEE), an examination administered to gauge the competency of students entering college. The NCEE was abolished in 1994 through Executive Order no. 632 by then education secretary Raul Roco and was replaced by the NEAT and NSAT. When the Department of Education, Culture and Sports (DECS) was officially converted into the Department of Education (DepEd), NEAT and NSAT were also abolished and replaced by the National Achievement Test (NAT). Check out complete statement of DepEd here. The official music video MV of 'Gayuma' (Potion) created by Abra featuring Thyro & Jeriko Aguilar now reached 15 million views ( 15,199,927) and considered as the most viewed OPM music video on Youtube. Published on September 30 of last year, GAYUMA peaked at #1 on YouTube Philippines and garnered 2 million views on its first week. Last November 25, 2012, 'Gayuma' got #1 on the MYX Daily Top 10, MYX Hit Chart, and Pinoy MYX Countdown. Currently on week 7 on the chart, it gets spot no. 4 at MYX weekly chart after zooming at top position last week. The song features a man who is in love with his partner, but it turns out the partner is a gay, which the man realizes later on after being given a potion. It has a similarity on a song released by famous Filipino rapper, Gloc-9 titled 'Sirena' which features a gay person from his childhood to teenage years being abused by his father. 'Sirena' is the second most viewed OPM music video on Youtube after hitting more than 9 million views this January 2013. Abra or Raymond Abracosa, the man behind the successful collaboration is a rising Filipino hiphop/rap star and fliptop artist. He started his career as a member of Pinoy hip hop group Lyrically Deranged Poets in 2010. He is also a major icon in the Fliptop battle league, as well as a co-host on PTV 4's show iConnect. Abra is a graduate of University of Asia and the Pacific (UA&P). According to Yahoo news, his father graduated from the University of the Philippines (UP) and took up higher education at Stanford University. No wonder the rapper's lyrics are deemed by many as intelligent. After being featured at ABS-CBN's Sunday shows, Abra earns more followers on social media and his skills is now widely known in the Philippines - the next Gloc-9 or better. He is set to do "Alab ng Puso" (theme of ABS-CBN's Juan dela Cruz) and collaboration with phenomenal box-office King, comedian and artist, Vice Ganda. On the top trending Google searches over the past seven days in the Philippines, 'abra' and 'gayuma lyrics' are among the top 10 local searches. Gayuma nga! Lang hiya! Ako’y naloko lamang! Isa kang malaking libag na tinubuan ng pisnge! Alam mo? Mukha kang tuhod na may bukol, na may sugat, na may nana! TheSummitExpress congratulates Abra for his great achievements. We look forward for his rising career. Banking on the sheer size of the combined Smart, Talk ‘N Text, and Sun Cellular subscriber base, wireless leader Smart Communications, Inc. (Smart) launches its biggest ever and most affordable unlimited offer called ‘Tri-Net Unli Call & Text 25’. The new product allows all Smart Prepaid subscribers to enjoy unli calls and send unli SMS to the combined 68.6 million subscribers of the three wireless brands, all at only P25 for one day. The package also includes 20 SMS to other networks. “With this tri-net version of our bestselling Unli Call & Text 25, we are ramping up our prepaid business by turning a great offer into an even better one,” said Melissa Limcaoco, head of prepaid and postpaid marketing at Smart. “It’s still unli, but it’s now tri-net – which means that Smart Prepaid subscribers can stay in touch and enjoy virtually endless conversations and SMS exchange with their friends and family, but their world has become so much bigger since now they can also call or text people using Sun. What’s best, we’ve kept it to its flat rate of only P25 for 24 hours’ use,” Limcaoco added. To avail of Unli Call & Text 25, subscribers must have at least P25, then register to the package by sending UNLI25 to 6406. Once registered, users can start sending an unlimited number of tri-net SMS to any Smart, Talk ‘N Text, or Sun number. They can enjoy unli calls by calling *6406 plus the 11-digit mobile number, e.g., *640609181234567. “Combine the flexibility of keeping in touch with the most number of people via calls or SMS with Smart’s superior nationwide network coverage, and you have a service that simply cannot be matched – and that’s Tri-Net Unli Call & Text 25,” Limcaoco added. Limcaoco refers to the recently reported results of the National Telecommunications Commission’s (NTC) 4th Quarter Quality of Service (QoS) Benchmarking tests, validating the superiority of the ‘supercharged’ Smart network over competition. “This supercharged network is what allows us to offer services that are extremely high in value but very easy on the pockets,” ended Limcaoco. 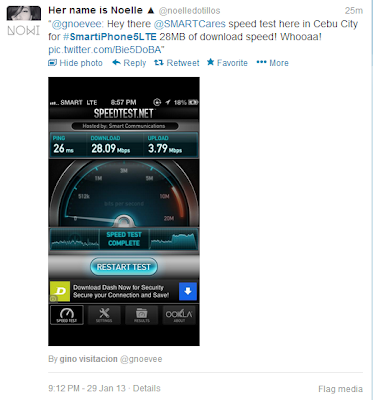 Smart has over 52.6 million mobile subscribers as of end-September 2012, more than 90% of whom are on prepaid. They are served by a network of over a million Smart Load retailers all over the country selling Smart Load and other bucket offers. Smart has the largest and most pervasive cellular and broadband network infrastructure in the country, providing coverage to over 99% of the population. 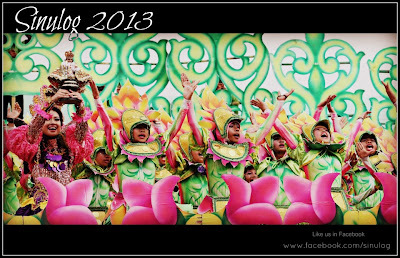 Sinulog Festival 2013, one of the most awaited celebration in the Philippines that commemorates the Filipino people's acceptance of Roman Catholicism and an adaptation of famous Ati-atihan festival of Kalibo, Aklan. TheSummitExpress brings here schedule of activities, photos and video for quick track on what's happening at Cebu on the month-long festival. 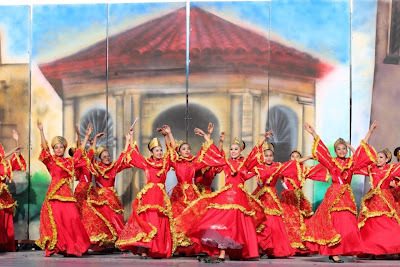 Wikipedia says that the word Sinulog comes from the Cebuano adverb sulog which roughly means "like water current movement;" it describes the forward-backward movement of the Sinulog dance. The dance consists of two steps forward and one step backward, done to the sound of drums. 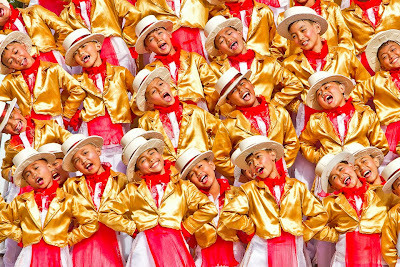 Highlights of the festival are the Santo Niño procession on Saturday, January 19 and Sinulog Parade on Sunday, January 20. Around four million of attendance is expected over the weekend. 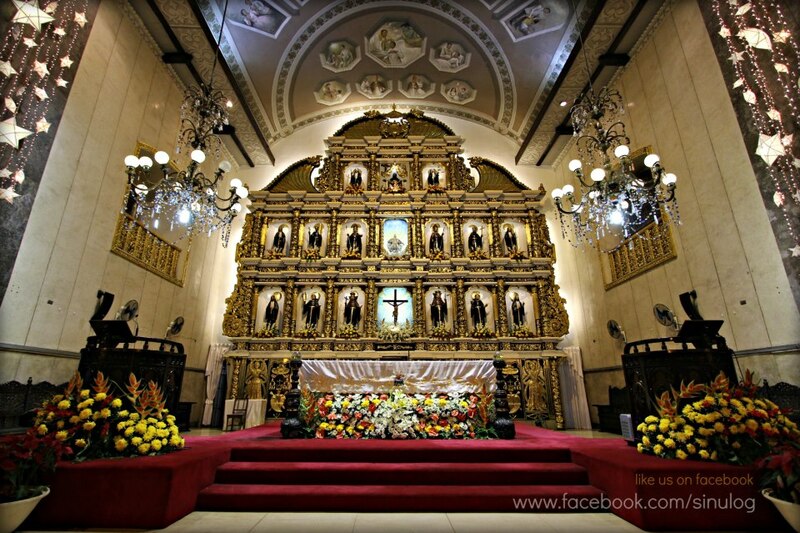 The route where the Santo Niño will be paraded is 6.1 kilometers long. It will be an estimated 7 hour-long procession starting from 1 p.m. to 8 p.m., when the Santo Niño is expected to be back inside the basilica. On the grand parade, organizers said that there will be 42 dance contingents and 40 floats that will move like a carousel in Cebu City's major streets. Security officials are now ready for the flock of devotees. At least 2,000 policemen and 8,000 crowd control personnel will be deployed by authorities according to Sinulog foundation. Sinulog Street Fair Osmeña Blvd. College of Technology, Cebu Institute of Technology University, Saint Paul College Foundation, Inc.